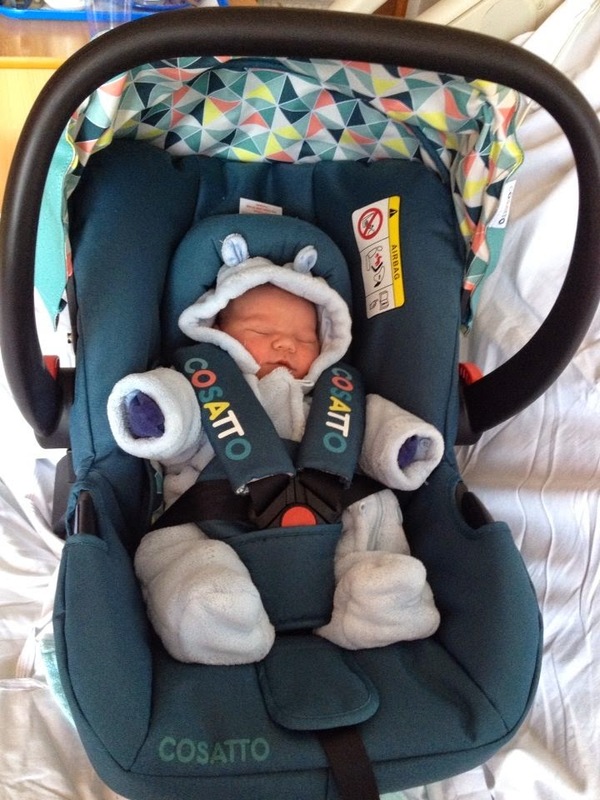 So, since it's been a week since the big event, I thought I'd better had write my birth story, to get it all down and give my experience of my third labour. To be honest, it wasn't anything like I'd expected. Both my other labours were near enough exactly the same. I'd had high blood pressure throughout the labours, I mean, off the chart blood pressure and had the choice between having the epidural which would bring my blood pressure right down, or a caesarean. Well I didn't want a caesarean so had the epidural both times which slowed down my labours but did help my blood pressure. So, when I'm writing about this labour, it feels weird that it's the total opposite of how I thought it would go. It all started at 3.30am on the 8th February. I woke up, for what felt like the one hundredth time to go to the toilet. But this time I felt weird. I wasn't in pain, well not any more pain than usual, but I just had this feeling that something would happen soon. You know when someone tries to explain labour and says 'you'll know when you're in labour, you just know' yeah that, well it annoys me too. How can you 'just know'. Well I'm sorry to tell you all, but you just do. I think as your body starts to prepare, your brain works in overdrive to get ready for the event that is about to take place and these are the signals that cause you to 'just know'. Anyway, let's get back on track shall we. As I said, I just knew that something was going to happen and so between then and around 6.30am I spent trying to sleep which didn't really happen. It was more of a skipping between being awake and a slight, very light sleep. Then I woke up feeling like a needed the toilet, and to my embarrassment, a little wet too. I went to the toilet and felt a trickle. No, I hadn't wee'd myself. I tiny little trickle of my waters. So that was the sign and I knew that we'd shortly be meeting our little boy. I got a towel and laid it on the bed before trying to get some more sleep. In all this time, I'd still had no pains at all. 7.30am arrived and I woke with a totally weird feeling. It's so hard to explain. Like someone had flicked the bottom of my bump, near to my cervix. But kind of a twisting flick. And that was it, water went leaking everywhere. At that moment in time I panicked. Not about labour, but my memory foam mattress that had cost us hundreds. I didn't want it ruining. (isn't it weird what you think about when stressed haha) So like some stealthy ninja, I grabbed the towel and jumped out of bed, screaming at my husband to go get towels, quick. And it kept coming, and coming, and coming. Seriously, how much water was in there? I was starting to doubt being pregnant and maybe I just had a bump full of water! But no pains, nothing at all. I rang the hospital to let them know and, as it's my third baby, they told me to come in when I felt ready, when the pains start and just really, when I can't bear it any more. What's the point in going in now I thought, I didn't even feel like I was in labour. So we got the kids dressed and warned my mum that we'd be dropping them off at some point. not even starting off small. Just a smack in the face with horrendous, agonising pain. Just after 8am, and they were coming every 3 minutes. Better get ready I thought, still no rush though, labour takes hours. I walked, with the kids and my hubby, to my parents house, only 3 doors away like and then we rang a taxi. By this time it was about quarter to 9. Getting out of the taxi at hospital, I felt like I couldn't walk. The immense pain was debilitating and I was gripping my husband as we walked to MAC (maternity assessment centre). After checking me, I was already 5cm dilated and they said I needed to go straight to delivery and they brought me a wheelchair. Now all I remember was feeling really angry. How did they expect me to get up and sit in a wheelchair when I was in so much pain. I just remember screaming at them (oh the shame) but I managed it, and we went the short distance to the delivery suite. After getting on the bed and my delivery midwife arriving, she went to check how far I was. I started screaming that I just couldn't do it, get me something. Something to take the pain off, I needed the epidural. Then she said it, 'it's too late'. In the 5 minutes in coming from MAC, I was 10cm dilated and he was ready to come. My husband asked if it was okay to pop to the vending machine to get a coffee just as I screamed, no, more like sounded like a possessed donkey, that I needed to push and the midwife pointed out that there was no time, he was coming now. 3 pushes, THREE! And he was out. I remember sucking the gas and air like it was going out of fashion and the midwife then put this baby on my chest. What, already I thought. My brain just couldn't get around the fact that he was here. I'm not really an emotional person, but giving birth does this. This overwhelming feeling of relief, pride, everything all rolled in one, and I just laid there stunned, cuddling this little boy that I had just given birth to. car seat which we used to take him home in. The placenta was delivered shortly afterwards and the cord was left attached to the baby until it had stopped pumping as this is supposed to be good for baby. The cord was then cut and, after the midwife getting both me and the hubby a cuppa and some toast (nice that they think of the partner too) we were left to have some bonding time with our baby. So, now I can finally let you all know, Joseph was born on the 8th February, 9 days overdue, at 9.28am weighing 8lb 3oz and is just adorable. As I had previously had 2 normal births and this was went so well too, they said that I could have a quick discharge, I didn't even need to go onto the ward. 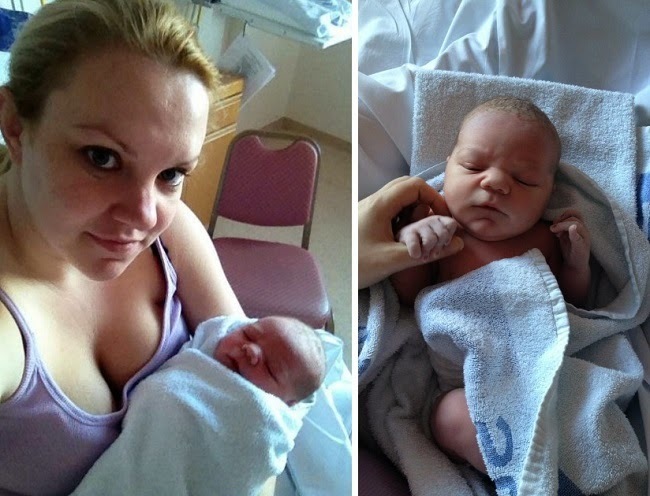 We spent a few hours in the birthing room, admiring our little boy, then they discharged us. We spent the rest of the afternoon just fawning over our new arrival, the boys just adored meeting him, and we are so happy to now be a family of five! When it comes to Valentine's Day, my husband and I aren't really the romantic types. Yes we'll get each other a card, but we don't do the mushy, mushy roses, chocolates, meals etc and usually opt for a gift that is useless and will come in handy. Something that will actually be loved by the recipient. I mean, yes, roses are lovely and all, but they don't last long and cost a fortune. This year, I wanted to get my husband something practical. I knew that he was waiting for his new phone coming out, the iPhone 6, and so was trying to think of ways that I could get him something practical to do with that. That's when I came across Tech21. Tech21 are phone cases that are designed to withstand accidental knocks and drops making them perfect for romance in the digital world. Each case provides market leading impact protection thanks to Tech21 Impactology’s promise to always provide the most intelligent impact protection. 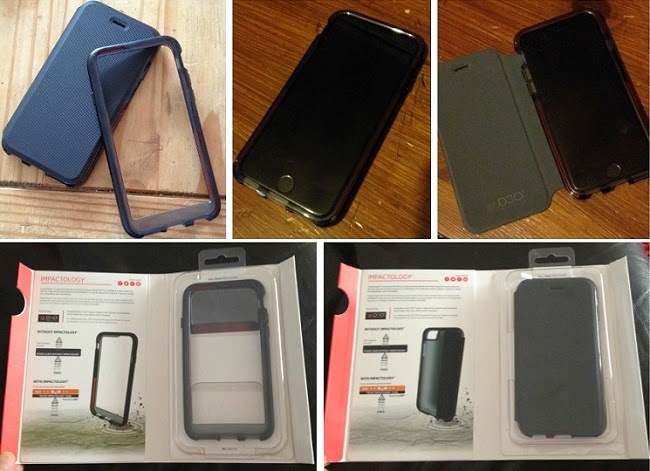 Tech21 use scientifically proven impact absorbing materials, ingenious design and unbeatable user friendliness to create cases that look great and protect too. Slim Fitting design – the Tech21 iPhone 6 case offers the ultimate protection without interfering with the overall design of the phone. I was sent 2 of the range out. Firstly, the Classic Shell with Cover which gives full protection all over the phone as it has the shell with back and a flip open front too. Secondly, the Classic Trio Band Case which is the ultimate minimalism as it is just a band around the edge of the phone. I love the idea of the full shell with cover as it means that the phone is fully protected, something that is great for my husband whilst he's at work as he's forever dropping his phone. When he doesn't need the full case though, like when he's at home, he now has the option to have just the band. I like this idea as it means that you still get to see the elegance of the iPhone 6 but you get the impact protection from the band. the fact that this is so lightweight and thin too means that you barely even see that it is on the phone. The range of Tech21 iPhone6 and iPhone6 plus cases are available direct from the Tech21 website and also from O2, Carphone Warehouse and EE stores. Well, I was supposed to be taking a break from the blog as bump was due last Friday and I want a few weeks to get my head around having three children. But alas, he I'd still holding out, well holding in actually and won't budge at all. 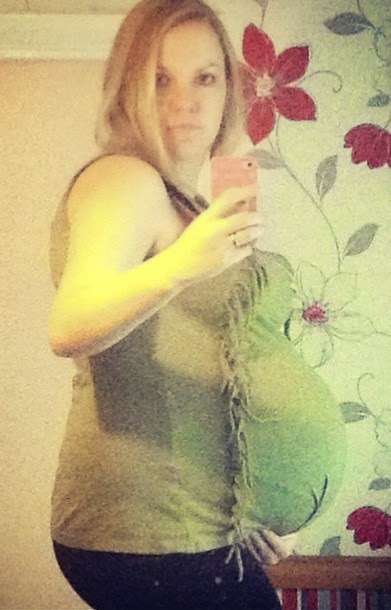 Today, I am 6 days overdue and getting very impatient waiting for bump to arrive. On Tuesday I went to the midwife who gave me a stretch and sweep to try and get him moving. A stretch and sweep is basically where she (the midwife) places 2 fingers into the cervix and sweeps around the edge of it whilst also stretching it a little. This is the try and separate the membranes and can bring on labour. The stretch and sweep itself isn't painful. It does feel a little uncomfortable, as you'd expect when someone is fiddling down there, but it's not that bad really. After the visit to the midwife, I went for a little walk as I thought this may help to push bump down and hopefully out. Towards the afternoon I was getting little achy pains so decided to try a hot bath. Hot baths aren't recommended in pregnancy as they can bring on labour, so now in overdue, that doesn't really matter. The hot bath actually started to work a little and I lost my plug. Not the bath plug haha but my mucus plug which is what covers the cervix. This usually happens before labour although the mucus plug can replenish itself so isn't actually a sign that labour is imminent. Oh, and in case you were wondering, a mucus plug basically looks a little like thick snot (tmi I know) and can have blood in it. I got myself quite excited at this point as the midwife had already pointed out that I was 2cm dilated, the stretch and sweep, walk, hot bath and fact that I'd lost my plug might actually work. Was this labour about to start? I decided, to help things along and probably make myself look like an idiot, to dance around the room, wriggling my hips and moving as much as possible. Again the aches were there. But then, it all wore off. As fast as it had started to be painful, that was it. It just disappeared. I was totally gutted! So now, it's back to the waiting game. 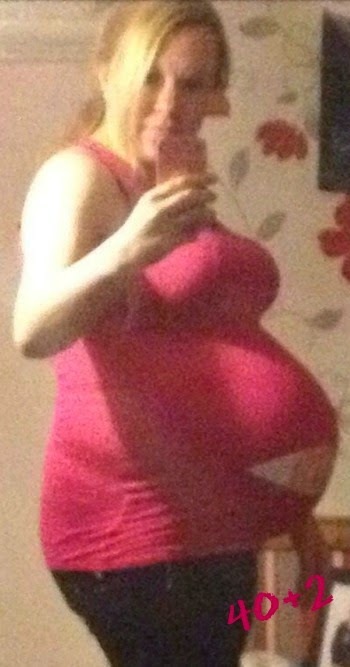 If bump isn't born by Monday then I will have to go into hospital to be induced. Well, not induced really, as I'm already 2cm dilated, they don't have to induce me, they'll instead just busy my waters and let labour start itself then.